The current function provides batch operations to visually inspect artifacts and normalization quality, by calling Display from SPM. We’ve added keyboard operations to the Display figure that users can press up/down to switch fMRI volumes of one subject and press left/right to switch subjects. Before running the frame-by-frame inspection, the current function exports screenshots of selected slices overlaid by a semi-transparent brain mask for a glimpse of the overall image quality. The function calls SPM Check Reg to visualize input volume, a keyboard callback is added to enable left/right and up/down to switch timepoint and subjects. 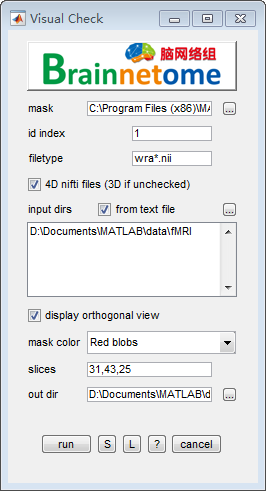 display orthogonal view: check to display orthogonal view of selected slices and save screenshots. uncheck will only save screenshots to out dir. mask color: color of the transparent overlaid mask. slices: modified image n-th slice of x,y,z to save. Up/Down: last/next timepoint of the same subject. Left/Right: same timepoint of last/next subject.